Made in Sheffield, England, the Sorby ProEdge Sharpening System is a consumer version of a system which was developed in the Robert Sorby factory over many years. This compact system is well suited for sharpening turning tools, carving tools, bench chisels, plane irons and other tools in your shop. 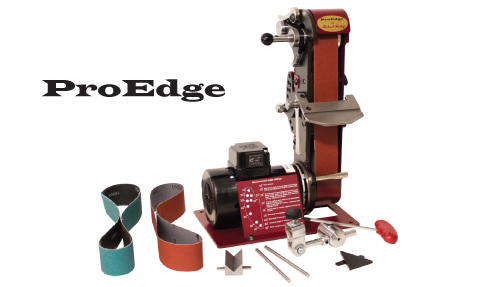 The Sorby ProEdge System includes: Grinder with 1/2hp motor, Tool Rest with miter slot, Sliding Skew Jig, Roughing Gouge Jig, Fingernail Profiler, 1 60 grit zirconium, 1 each of 120 and 240 grit aluminum oxide belts and instructions.